The common names for the Hardy perennial Actinidia include Chinese gooseberry and Kiwi vine. They typically flower in the late summer to autumn, and bear the popular kiwi fruit. Although they have the common name of Chinese Gooseberry, they are not related to the fruit of the same name. Latin names for chinese gooseberries and related plants include Actinidia polygama, Actinidia arguta, Actinidia kiwi and Actinidia issai. Where are chinese gooseberries from? Actinidia genus plants such as the kiwi Vine are mainly deciduous and originate from North east asia (they were brought to New Zealand for commercial purposes). The vines can grow to as large as 350 to 400 cm on fences and walls. Actinidia has purple hued leaves when young, as the plant matures these change colour to be pink and white. Common Names: Chinese gooseberry, Kiwifruit, mangüeyo, ArgutaHardy kiwi, Miyamamatatabi, Silver vine, Kolomikta vine. Height: Shrubs up to 20 feet (6 m), Vines up to 100 feet (30 m). Flower Details: White to yellow. Fragrant. Five or six petals. Solitary or in cymes. Plants are dioecious, with male and female flowers on different plants (female flowers lack pollen and nectar), be sure to grow both male and female if you are planning to harvest fruits. Fruit: Best fruits are produced in warmer climates. Large berry. Small seeds. 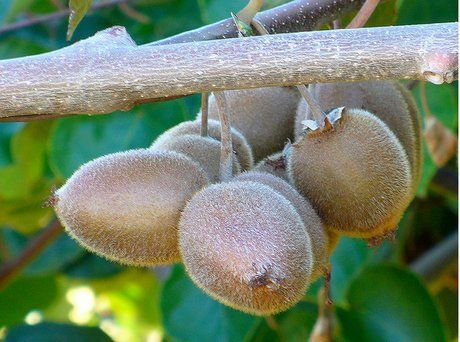 Most species have edible fruit Actinidia deliciosa, the Fuzzy Kiwifruit is an especially popular supermarket fruit nowadays, it is oblang and about 2.5 inches (6 cm) long. Foliage: Woody. Simple. Alternate leaves. Oval to circular. Long petiole. Red hairs on young leaves. Dark green. Sow Outside: Seeds: 1/8 inch (3 mm). Start of spring - before the last light frost, or towards the end of autumn. Sow Inside: October and November. Germination time: two to three months. Temperature: 50°F (10°C). Transplant outdoors in spring or autumn. Space at about two feet (60 cm) apart if growing for fruit, or singly if growing as an ornamental vine (unlikely to set fruit, unless other vines are growing in the vicinity). Requirements and care: Full sunlight or shade. Good drainage. Humus rich, fertile soil. Keep moist. Plant both sexes to ensure fruit set. Early spring prune. Thin out stems. Provide trellis. Regular watering during dry periods. Will take two years to flower. Propagate: by taking cuttings in the summer. Miscellaneous: If you are planning to grow Actinidia kolomikta (Miyamamatatabi) for its berries, then beware that cats are crazily attracted to the plant and will often destroy it; even growing Nepeta cataria is unlikely to distact a cat! It is best to sow Actinidia at a depth of 1/4 cm, either singular or with a spacing of 60 to 75 cm in the spring or autumn. Actinidia plants like both sun and shade, but for best results should be grown in full sunlight; to produce vibrant colours. The soil should be well drained, humus rich, fertile and moist. Actinidia requires between 60 and 90 days to germinate, if starting seeds off inside it is best to do so in October or November then transplant them in the early spring, whilst there is still a chance of a light frost. The Kiwi Vine (Actinidia) requires watering in the dry days of summer, it is also necessary to supply a trellis as support for the the plant. The vines should be pruned in the spring, and tidied up when necessary. Kiwi vine goes by many other names including, Arguta, Bower arguta, Bower actinidia, Kolomikta Vine, Silver vine, Tara vine and Yang Tao.